This species is native to Japan and is considered a relative of H. longipes . The plant grows to a medium size about 12 inches in height by 16 inches wide as a mature clump. It has rippled margins on the leaves which have a long, narrow tip. The leaf petioles have reddish purple dots and the leaves come to a distinct tip. Funnel-shaped, pale purple flowers with subtended whitish bracts bloom in September to October. The flowers have purple anthers which is a distinguishing trait. At one time, this was known as a botanical variety (i.e. 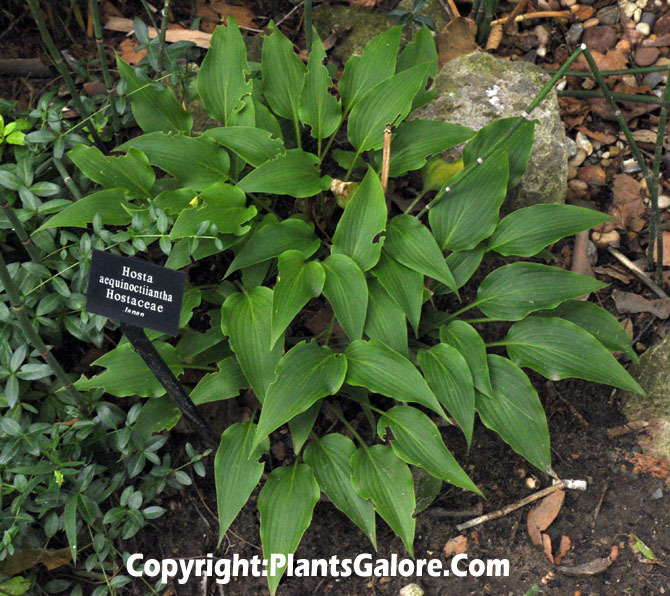 found in the wild) of H. longipes but The Genus Hosta by W. George Schmid (1991) designated it as being a full species. He says that its Japanese name means "hosta of the equinox" i.e. flower buds are set about the time when the day and night are of equal length. This species was first collected from the wilds of Honshu Island of Japan in 1941 from rocky ledges and outcroppings. According to The Hostapedia by Mark Zilis (2009), "...useful in a breeding program for its flowering habits and smooth green foliage. The whitish bracts also have ornamental value." An article by Hajime Sugata of Japan in The Hosta Journal (1994 Vol. 25 No. 2) states that "H. aequinoctiantha grows only at the Yoro Mountains in Gifu Pref. It is found abundantly around rocks of Yoro Waterfall, a sightseeing place noted in Japanese folklore. The natural habitat of H. aequinoctiiantha is restricted to a small area; its flowering period varies. The intermediate species between H. longipes and H. aequinoctiiantha is found on rocks near streams in the deep Midori Valley, Neo Village, Motosu County. The flowers are beautiful deep purple."